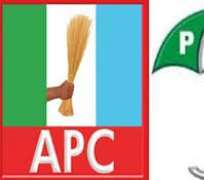 More than 4,000 members of the All Progressives Congress (APC) on Wednesday defected to the Peoples Democratic Party (PDP) in Keffi and Kokona local government areas of Nasarawa State. A correspondent report that the defectors were formally received into the PDP fold at Keffi and Garaku, the headquarters of Keffi and Kokona local government areas, respectively by the state's Chairman of the party, Mr Yunana Iliya. Speaking while receiving the defectors, Iliya commended their decision to join the PDP and urged members of other political parties in the state to also join the party. He commended their courage of the defectors and urged party loyalists to embrace the new entrants. The PDP state chairman assured that the party would continue to initiate programmes aimed at bringing development to the people. Iliya appealed to the electorate to vote for PDP candidates in the upcoming local government elections in the state as as well as in subsequent elections. He said that, if elected, the party would embark on massive construction of rural roads to open up the rural areas in the state. Iliya said that the plight of women, children, persons with disabilities as well as other vulnerable groups would be also given top priority by the party. While appreciating the people for sustaining peace in the two council areas, Iliya urged them to sustain the culture of tolerance and peaceful co-existence. He also called on the public to support the efforts of security agencies in maintaining peace in the area. Anfani said that most of the people elected under the platform of the PDP had carried everybody along irrespective of tribal, religious and political inclination in the state . Also speaking, a member of the state assembly (PDP- Kokona West), Mr Danladi Jatau, assured 100 per cent victory of the party in the upcoming council poll.